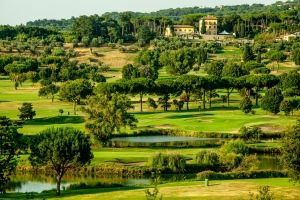 The Eucalyptus Golf Club is one of the most interesting golf courses in the Latium area. 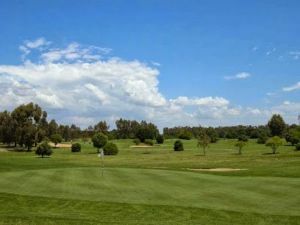 The golf course is set amidst olive trees, secular oaks and eucalyptus trees. The holes are designed in a balanced way and are challenging, yet still allow a relaxing game. Some holes will severly test golfers who are not masters of their tee shots. As well, many greens demand remarkable skill and gauging. Worth particular attention is the 4th hole. A par 5 measuring 480 meters that is both demanding and delicate, due to out of bounds on the right with a prevailing up wind. Eucalyptus is 20 minutes from Rome, in via Nettunense km 26.400, 10 minutes from Anzio and Latina. Leaving Rome , you proceed on via Pontina, exit at Anzio-Nettuno, proceed 4 km as far as Campo di Carne. If you like, you can catch the train for Nettuno from the centre of Rome (Termini Station) and in 35 minutes stop in Campo di Carne, where the private entrance to Club is immediately there. By air from Fiumicino airport take thr Ring Road and exit at via Pontina (26: Pomezia-Latina, then turn Anzio-Nettuno). 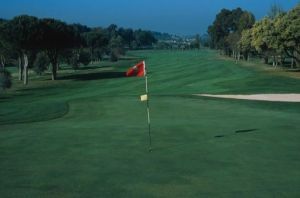 Eucalyptus Golf Club is not yet in our pool of Golf Courses for orders.